In part three, Zinczenko takes a stab at holiday dinners. For Thanksgiving, he covers ground about white turkey meat verses dark meat, leaner portions of cranberry and starches and finally pumpkin verses pecan pie; which is better and why. 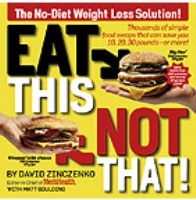 As you might imagine, we've added Eat This Not That to the mix in the Sound RIDER! online store. You can buy it at lots of bookstores, but we want you to buy it from us. To sweeten the deal you'll get a directory of 35 great places to eat in the Northwest when you buy the book. Click here for more details.